I have just recently started following this discussion regarding the seax. I hope that the following is found to be useful, although it may turn out to be a red herring. I have the fragment of a single edged weapon, represented at one time as a 9th or 10th centuary dagger or child's sword, however I am looking in to the possibility that it is a seax. It has a small "tea-cosy" pommel (about 1.25 inches wide, 1 inch deep and .75 inches tall), a 3.5 inch long grip area/tang and a 3 inch wide lower guard. 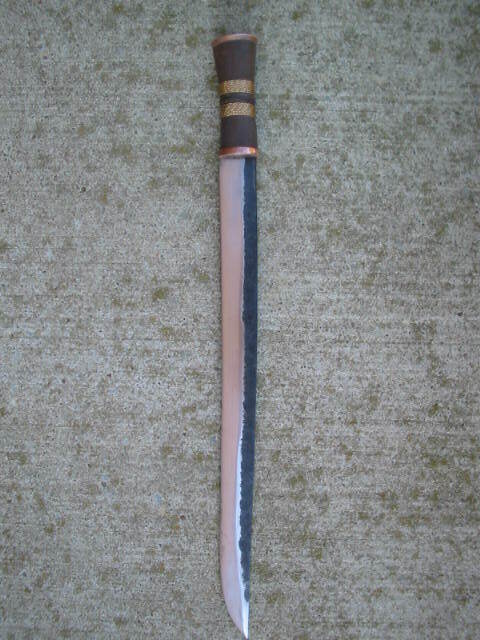 The hilt area is about 4.75 inches in total length. What remains of the blade is about 7/8 inch wide and 6 inches long, although I can see it was longer originally since the end is clearly broken and the ridge on the non-edged side of the blade extends all the way to the tip. I am looking into the possibility that it could be a seax because of the single edged blade, the width of the blade, and the fact that the grip area is long enough to accomodate a man's hand. On the other hand, it does have a guard, tang and pommel that do not match my previous conception of a seax. In answer to Jay's most recent question -- assuming the the blade on this piece wasn't much longer than six inches, the distal taper appears to be about that typically seen with a single edged sword ... but take that with a grain of salt since I have no idea of whether this is a seax in the first place! If it isn't viewed as hi-jacking Jay's topic, I would welcome any and all comments as to what this piece was and how old it could be. 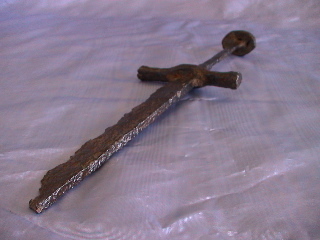 To me this looks like a single edged back-up weapon from the 15th C. A single edged short thrusting sword of some kind. It makes me think of illustrations in Swiss chronicles of the late 15th C. It has some likeness in character to the more bayonette-like Grosse Messers. It is only the fact that the tang is hidden like that of a sword that does not make it a good example of that weapon type. These were very popular and no doubt effective weapons. There is a similar weapon, single edged and with Messer style hilt in the Royal Armouries in Stockholm. This one is classified as a 18th C hunting sword, but it is actually a 15th C Grosse messer. The weapon in the picture could well have had a blade that was two to three times as long as present length and I would guess the point was triangular in section and very pointy, centered in the blade or in line with the back. A little distal taper, but not overly much (35-45%?). They tend to retain much of the thickness at the point. A long sax (langseax) is a long bladed weapon that usually has a knife style grip (as a norm with hidden tang and not riveted on slabs) The Long seax can have a long grip, perhaps 25 cm or sometimes even longer. These weapons will have a blade of some 55 cm up to proper sword-length blades. 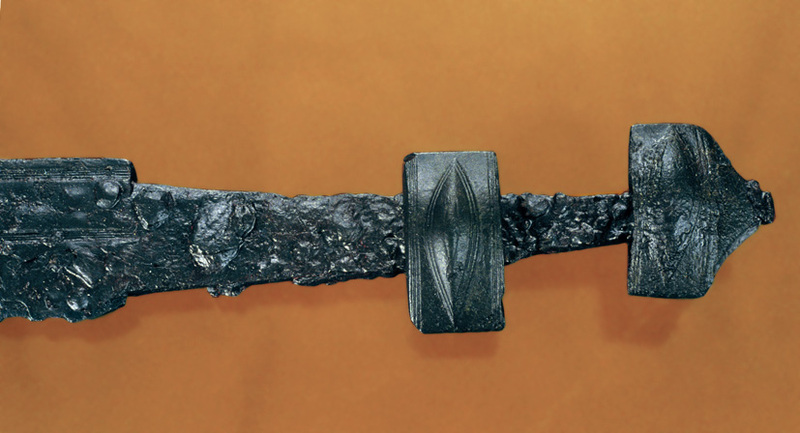 They still do not have sword style hilts however: they are typically mounted just like very big knives: a hidden tang of almost the same width as athe blade secured with pitch and sometimes a rivet at the protruding end. There are naturally variations to this, but these should not be regarded as typical examples ot the classic seax. Distal taper of seaxes: All edged weapons will typically have some degree of distal taper. It is a natural result of drawing out the blade blank and is a logical solution when you strive to make an effective and well balanced blade. Distal taper can never be regarded as a isolated feature, but should always be seen in context with the type and function of the blade. Shorter blades can do with less distal taper and must sometimes retain more mass in the point section to be able to deliver an effecive blow. The clip point style seaxes manages an effective distribution of mass through the dramatic taper in witdth in the point section and a beefy and sturdy tang. (This is in fact very similar to the principle of tang design on japanese blades) In these weapons you will want some more thickness in the point for it to be an effective cleaving weapon and leather awl. The point is generally of stout triangular section, almost equal sided. Section of the body of the blade is also typically triangular with slightly convex sides. A typical seax is less a big bowie knife and more a nightmarish version of a tanto or wakisashi. The contintental type with a point of symmetrical silhouette retains more width towards the end and must therefore have a bit more distal taper (as a rule of thumb). This will of course depend on the overall size, lenght and mass of the weapon. Narrow blades (one inch wide or so) can be surprisinlgy thick in the spine: some 10 - 12 mm. Broader blades will be thinner but will typically be thicker in the spine than would a sword of similar width, perhaps some 6.5 - 8 mm thick at the base for a blade that is 4.5 to 5 cm wide and 40 -55 cm long. Thanks for sharing your insights, Peter! Fantastic information Peter. Thank you so much for your input. It is a real privilage to have you on this forum. Nate B. give me a copy of Early Anglo-Saxon Shields a couple weeks ago, and I just happened to notice that there is a photo of the Repton stone in it. Seems that the sketch of the Repton stone that is used very often(the one posted earlier) is somewhat off. In the sketch the handle looks somewhat like it might swell at the end. However, this isn't the case when you look at the photo of the stone, it looks more like a sphere on the end of it. Frankly I really don't know what to think about it... It doesn't make it any easier since there is portions of the stone missing in the grip area. Without a better picture or seeing this thing in person I would be hard pressed to say what is going on. It seems then that seax is one of those having some ort of cap or pommellike feature at the end of the grip. What is the dating of this stone? During some periods this seems to have ben a more common feature. Thanks Peter, great information as always. I had always brushed off the Hjortspring weapons as not being something I was really interested in, getting a more clear idea of what they would have looked like has changed my opinion on them. Tried checking out dates for the germanic carving knifes, and the latest I have been able to find has been the one found at Vimose. I would guess from the earliest stage of deposit, but I don't know. For some reason I had been thinking these were in use later than what they were. Eric had told me about the reconstruction you did, after seeing the picture I now get more of what he was telling me about. I thought I would add a Pic from the bog that may be of interest. The Repton Stone dates to the 8th century. I know you mentioned buying Early Anglo-Saxon Shields, but I'll still try and scan a copy of the photo and include it with your other stuff. We just bought a new three in one, so here is a scan of the photo. I'm constructing a scabbard for a scram seaxe and was trying to find out about historically accurate ways to attach it to a belt (8th-11th Century). Could anyone point me in the right direction? I know that this question has pretty much been answered, but I wanted to point out that the washer-like discs on the "raven-head" saex seem to be made of horn. Horn seems, at least from what I have read and seen, to have been a relatively common material in that time. It makes sense. Horn is pretty much a renewable resource, and can come from domesticated animals that are handy to have around for other reasons. Thus it is cheap and available. Though not as strong as iron, it is tougher than wood. I think it would be just about the ideal material for someone who wanted a functional tool/weapon, but couldn't spend a lot. Besides, I think horn is rather attractive. Any saex I make or buy will end up having horn on it, I think. P.S. I noticed that the end of the handle on the "raven-head" saex and the fuller on one of those from Vimose are awfully remenicent of those seen on falcatas. I think I am begining to see a conection that I previously viewed as rather tenuous. Just a fast one about a scramasax i found pics of, OL63cm W4cm found in Finland.